Samsung Electronics, Cisco and Orange unveiled today two promising industrial 5G applications – a drone and an industrial robot, at the MWC19 in Barcelona. From February 25th to the 28th, the three companies will demonstrate the 5G-equipped devices at the exhibition for the first time. A Drone carrying a very low latency, high-quality video system is piloted from the Orange booth at the Fira de Barcelona. The drone, which is located outdoors at an Orange datacenter, carries a 5G router (CPE) that is used to transfer commands to the drone and transmit a high-quality video feed with low latency. 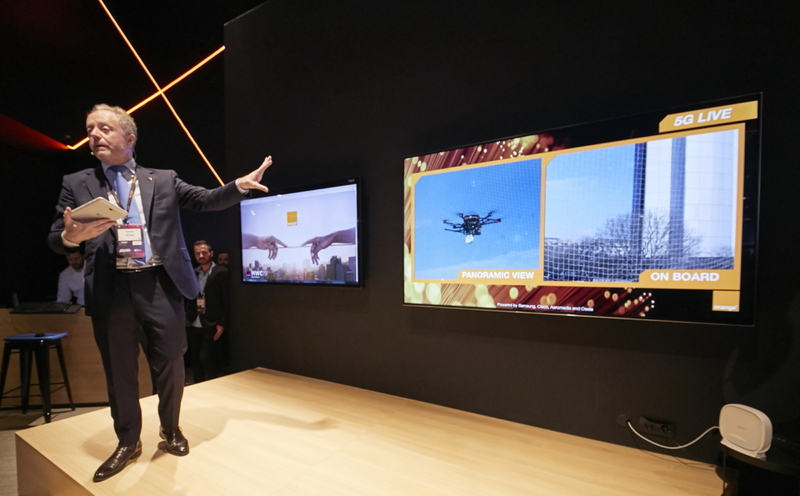 At the Orange booth, the pilot can be seen controlling the drone by using a 5G tablet. Aeromedia, a leading drone operator, collaborated in this demo. An autonomous robot carrying manufacturing parts transmits live video feeds taken by a 360º camera and a Full HD camera, both installed in the robot. The video streams allow operators to monitor the robot’s environment remotely, and to react and control it when its autonomous operation is interrupted due to unexpected obstacles in its path. The video and the commands controlling the robot are transmitted through a 5G network. This demonstration was done in cooperation with Acciona, a global company providing renewables, infrastructure and services. The demonstrations show industrial use cases powered by 5G’s ultra-reliability, low-latency and high-capacity. Samsung and Cisco joined forces for this live demonstration. Samsung used its 5G solutions including virtualized RAN, one of the smallest 5G access units, multiple indoor and outdoor 5G routers, and 5G tablets. Cisco’s Ultra Gateway Platform delivers a 5G virtual packet core on top of Cisco NFV Infrastructure that brings enhanced throughput and flexibility. Leveraging the wide bandwidth available at mmWave bands, like 26GHz, and advanced antenna technologies like massive MIMO and beamforming, the companies were able to achieve mobility, a very low end-to-end latency, and high capacity enabling the transfer of high-quality video feeds.